ARCHOS FAQ - How can I check my data usage? 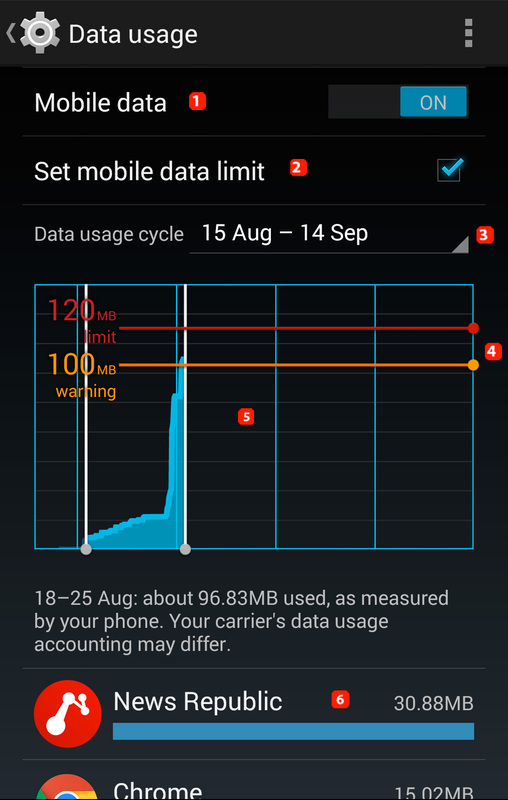 Your device calculates your mobile data consumtption of over time and keeps graphs on its use. You can view your usage and set a limit in (or ) Settings > Data usage. 4. Maximum usage.The orange bar is a warning bar, a notification will warn you if you reach this. the red bar represents the limit you fixed, a notification will be sent to you if you reach it. These two bars can be placed where you want. 6. Usage details for each app, letting you check which app uses too much data. Please note that the Menu (or dedicated button depending on your device) provides you access to various options as data roaming or display data usage in WiFi. The provided information are advisory only and may not reflect in any way your actual data use measured by your network provider.